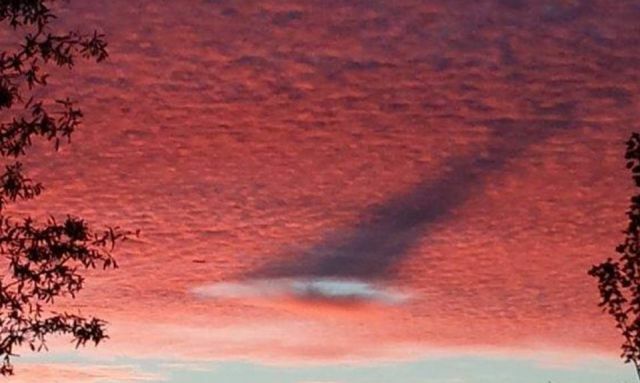 What caused this trail and punch hole in the clouds above Mesa, Arizona? On August 14, 2018 the photographer took a picture of an unknown object on top of the clouds that left behind a trail and a punch hole in the clouds above Mesa, Arizona. While at home on August 14, 2018 my wife called me outside to view the bright moon between the clouds. I went to get my digital camera to get a picture of it. When I got back the clouds had covered the moon so I stood outside my back porch waiting for the moon to reappear between the clouds. While waiting, at 18:53 I noticed at about the same angle where the moon had been a new light appear. This light was much smaller than the moon and actually brighter. 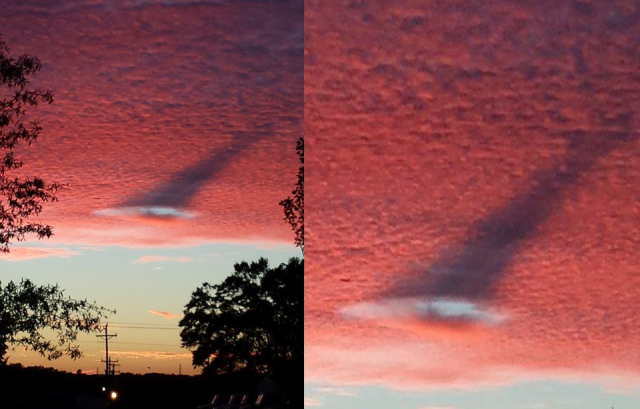 It was situated what appeared to be on top of some clouds in the western sky. I decided “what the heck” so I took a shot of this light (at first I thought it was a bright star). As I brought the camera down after taking the shot I noticed that the light had suddenly disappeared. I never saw the light again with the naked eye. A few minutes later the moon reappeared and I got a couple of shots of the moon. When I pulled the pictures up I was astonished to see that the camera had captured a trail from the object’s original position moving southward and upward from it’s original position. As you look at the picture you will see that I accidentally moved the camera while the shutter was open. You can line the clouds up with my original position and see my movement. However the trail left by the object after the camera movement made by me does not show that the trail was caused by any movement, at least from my perspective. Photographer has submitted the images to Mufon case 94326.